It is after dark on September 14th before the trading of rounds ceases atop the pass at Fox Gap. Confederate General D.H. Hill moved his troops away from the summit as the night becomes fully dark realizing that no reinforcements will be available for another defense tomorrow. On the Union side of the line at the gap, it is a long and anxious night as wounded men are slowly moved back down the mountain and on to Middletown for treatment. It is also a night of uncertainty for those units that were not committed to the previous day’s fight. The officers and soldiers of the 8th Connecticut lie in their battle positions throughout the night with no idea of what the morning will bring. The sun rises from behind the Union troops lying in their positions on east face of South Mountain as they wake early with orders to make coffee and prepare to assemble for movement. A significant logistical challenge is presented by the narrow mountain road leading through Fox Gap and the thousands of soldiers from IX Corps that will have to make the passage. As the generals attempt to determine the best method of moving the units through the narrow mountain road, the 8th Connecticut is ordered to move to the far side of the Old Sharpsburg Road and then returned to the eastern side of the road. Along with the rest of Harland’s Brigade, the 8th conducts a movement toward Fox’s Gap at the top of South Mountain in preparation for the passage. At the time, the strength and disposition of the Confederate forces is unknown. As a precaution, all of the regiments of Rodman’s Division form a line of battle and prepare for possible resistance from the Confederate forces. However, there will be no more fighting here this day because the Confederates are gone except those who now lie where they fell the day before among the rocks and trees. 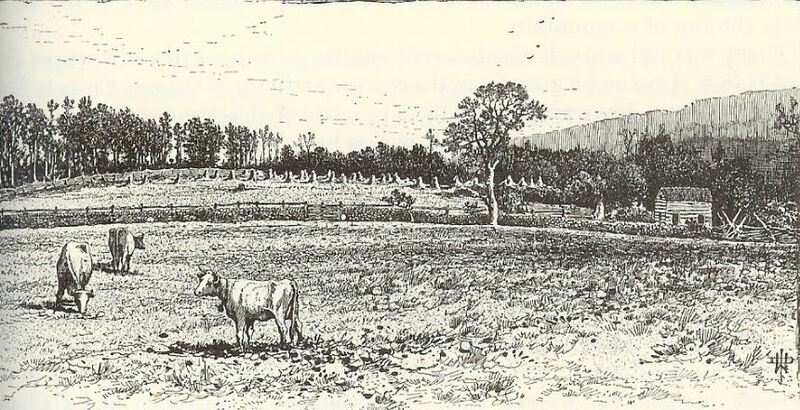 The soldiers of the 8th Connecticut would never forget this ghastly scene as they passed through the Fox Gap and passed the area of the previous day’s fighting. For miles, the fields on both sides were crowded; the waning fires at least revealing in quaint light and shadow the almost count-less bivouacs of a silent and sleeping host. …we came out of our hideing[sic] place and we marched across road to left into another piece of woods and there waited 2 or 3 hours see attack but they did not make any. Then we marched back and on over mountain and such sights I never saw. Hundreds of dead rebels laid piled up in a small narrow lane and behind on rd stone wall. The victory was ours… we passed by hundreds of dead sccesh lying beside stone walls in narrow lanes and scattered through the wood. Sadly, many of the dead Confederates were hastily tossed down the well of Daniel Wise, a local farmer whose farm had been at the center of the fighting. The dead rebels were strewed all along the road in scores. Up to 12 ock all has been quite with the exception of a few random shots. We lay on our arms about 2 hours. Probably too allow the Artillery to change their position…the rebels are on the skedaddle our Reinforcements are coming[sic] up and we are persuing[sic] them right up to the handle. Afternoon and all is quite on the East side of the Blue Ridge. Troups[troops] are pouring on to a great rate. Near the summit of the County road on our left, the slaughter was fearful. Our batteries were posted at the top and the rebels made repeated attempts to retake the position by charging straight up the road in face of a storm of grape and canister. The next morning before our artillery could pass down the road it was necessary to pile out dead rebels like cordwood on the sides of the road. This entry was posted in Death and Burial, South Mountain and tagged Case, graves, Oliver Case, South Mountain. Bookmark the permalink.